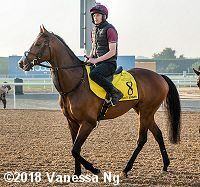 Reride (inside) checks out West Coast on Thursday morning at Meydan. 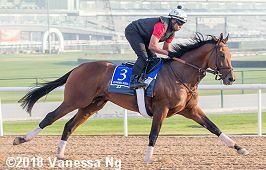 On Thursday morning in Dubai, entrants for the $10 million Dubai World Cup (G1) and its rich undercard were at Meydan Racecourse on the main track. Conditions were typical for late March in the Emirates, with clear skies and temperatures in the low 70's during training hours before climbing to the low 90's during the day. The races will be run Saturday evening (Saturday morning in North America), with the World Cup going to post at 9:40pm local time (1:40pm ET). In North America the full card will be broadcast live on TVG in the U.S. and HPI-TV in Canada. In addition, NBC Sports Network will broadcast just the World Cup live from 12:30pm. 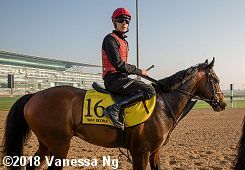 Here are photos and comments for 16 horses that were out Thursday morning plus some scenic shots. Please click the smaller photos to see a larger version. 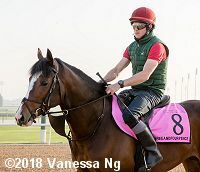 Forever Unbridled (Dubai World Cup) galloped 1 1/2 miles under exercise rider Pedro Velez, with owner Charles Fipke watching from the rail. He said, "She looks pretty awesome. She's still getting acclimatised, but she looks very nice. (Trainer) Dallas (Stewart) calls all the time and has been giving me positive reviews. She's quite valuable. To run in a $1 to $2 million Group 1 when she's worth 15 times that doesn't make sense to risk her. But, for a big purse where she could win $6 million, it's worth the risk. If she wins, she'll be the first mare ever to do that. It's nice to be first. I like to be first with whatever I do." 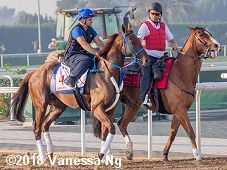 Gunnevera (Dubai World Cup) became slightly lame on Wednesday but after a long foot soaking and a shoe change he was improved. Thursday he schooled in the gate then jogged the wrong way. Trainer Antonio Sano said, "Thank God, he is perfect now. He had a little bruise on his left front foot, so we pulled the shoe and soaked the foot in water with Epsom salt. We left the shoe off overnight and then replaced it this morning. The farrier told me, �Antonio, take care of this horse and he'll be good for the race.' He did a great, great job with the foot. I am so happy with my horse and I hope he will be 1,000 percent for the race." 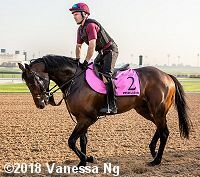 Mubtaahij (Dubai World Cup) schooled in the starting gate before galloping once around. Trainer Bob Baffert said, "You can't come in here with a �B' horse. I'm really excited and it's a privilege to be here, but this race is a challenge. You can't be afraid to get them beat." 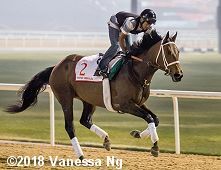 Pavel (Dubai World Cup) galloped twice around under exercise rider Amir Cedeno as race rider Mario Gutierrez and assistant trainer Leandro Mora watched. Gutierrez said, "He has the potential and he has the ability to run really good. He's tactical. That's his best talent. I can rush him and he's not going to run off on me. I can place him exactly where I want to place him. This race on Saturday is going to have enough speed. It won't be like last time and I'll be able to cut out a nice trip. When I ask him to go, he really explodes. He has a tremendous kick and I'm hoping he shows up on Saturday with the best of his ability." 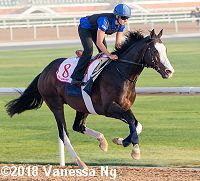 Talismanic (Dubai World Cup) cantered 1 mile under exercise rider Amelie Foulon in company with stablemate Rosa Imperial (Godolphin Mile). Lisa-Jane Graffard of Godolphin said "He looked nice and relaxed. Talismanic cantered as did Rosa Imperial and they looked really nice and happy in themselves." West Coast (Dubai World Cup) schooled in the starting gate before galloping once around. Trainer Bob Baffert said, "The gate here used to be smaller. Silver Charm didn't fit in it. You have to get them used to it because it's narrow (compared to an American gate). So, this gives them a chance. When they get in there it might get a little tight, so you just back them out of there and put them in again. I've always done that when I school horses. They fluffed up the track and it has a cut in it and they both went over it great. West Coast likes this kind of track, a soft, sandy track. He looks really good and he looks strong. He hasn't lost a pound." Idaho (Sheema Classic) came out with all of his stablemates at 7:00. "It took us a while to get his travelling routine right. He went across to America and Canada a few times and was never really himself. His best run was when he finished fifth in the Japan Cup, always a very strong race. He shipped better then and that was a longer trip, too. He is entitled to run well on Saturday as he is bit more experienced. He has a nice draw in two and seems to have travelled well so we're hopeful. ", trainer Aidan O'Brien said. Lancaster Bomber (Dubai Turf) came out with all of his stablemates at 7:00. "Lancaster Bomber has progressed well from three to four. He ran at this meeting last year when a good fourth in the UAE Derby so he knows the environment. 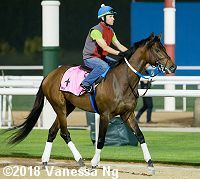 Maybe running him on the dirt is something we will keep in mind for later, but for now nine furlongs (1800m) might be as far as he wants to go. He is one of the highest-rated horses in the race and he loves the fast ground he will get at Meydan. He's a very hardy horse and he could travel plenty this year." War Decree (Dubai Turf) came out with all of his stablemates at 7:00. Aidan O'Brien said, "War Decree got a late invite and we were very happy about that. He is in good form." 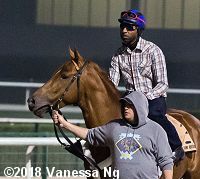 Mind Your Biscuits (Golden Shaheen) made his way into the Meydan dirt track at just after 6am accompanied by trainer Chad Summers, who made the 2 mile walk alongside his horse. Minimally equipped today, without his usual shadow roll and drop noseband, the chestnut took an easy 2400m jog going the right way. As he finished up, Hit The Bid (Al Quoz Sprint) galloped up his inside and Mind Your Biscuits grabbed the bit to try to fight past. Summers was happy with the jog and pleased at his reaction to the horse trying to pass. Regarding the draw of post one, Summers was initially not pleased with his late runner being saddled with the rail. "After contemplating, reviewing and tossing and turning thinking of the race, you watch him today and all your worries float away," he said. 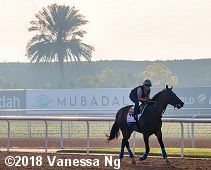 Mendelssohn (UAE Derby) came out with all of his stablemates at 7:00. Trainer Aidan O'Brien said: "He has drawn well in the Derby. Things have gone to plan with him." 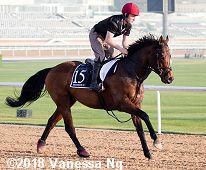 Reride (UAE Derby) galloped twice around. He is the only U.S.-based horse entered. Threeandfourpence (UAE Derby) came out with all of his stablemates at 7:00. Trainer Aidan O'Brien said: "Threeandfourpence should improve from the run at Dundalk." 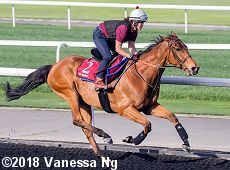 Big Orange (Dubai Gold Cup) suffered from setfast after working on Monday morning, he stayed at the barn on Tuesday and had had a steady canter on Wednesday. This was his first proper workout since. "That was a heartening sight," said trainer Michael Bell. "The hour after the work was when we worry that the setfast might return but he came back to the barn very, very well. That's a relief. It's stressful enough having runners in big races without this added stress. I'm very lucky that Gillian (Dolman), who travelled the horse, is very experienced. But in terms of condition, the horse is the best he has ever looked. We might do very little with him tomorrow." 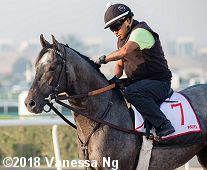 Economic Model (Godolphin Mile) looked extremely sharp as he galloped once around the dirt track at 7:10am under assistant trainer Guezal Cruz. 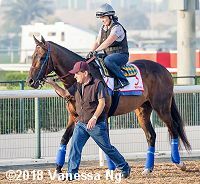 He will be the first representative to run in Dubai from the powerhouse stable of Chad Brown, who recently won honours as America's most outstanding trainer for the second consecutive year. Regardless of the outcome of the Godolphin Mile, the horse will remain in Dubai to be transferred to the care of trainer Nicholas Bachalard for new owner Sheikh Ahmed bin Rashid Al Maktoum. Washington DC (Al Quoz Sprint) came out with all of his stablemates at 7:00. Ryan Moore gets the call Saturday night out of post 2. Today the Aidan O'Brien horses got out of quarantine and were on the track together. 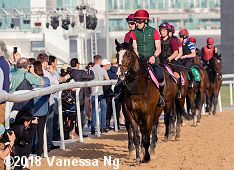 O'Brien said, "We go to the UAE Derby with three horses. They all came out of their race at Dundalk well (the Patton Stakes won by Mendelssohn) and I'm happy with them. 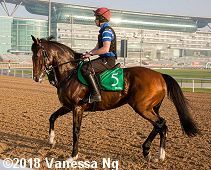 We will learn more about Mendelssohn in Dubai, especially how well he stays as he is a strong traveller." 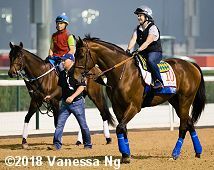 On Thursday evening O'Brien was named Best Trainer for 2017 at "His Highness Sheikh Mohammed Bin Rashid Al Maktoum Horseracing Excellence Awards" ceremony. His 28 Grade/Group 1 wins in 2017 broke the record set by the late Bobby Frankel. Scenic Meydan with Dal Harraild (Dubai Gold Cup) on the left and Mubtaahij (Dubai World Cup) right.